I always find it difficult to begin a blog post these days without apologizing or explaining why I have been away for so long. In truth I don't enjoy being away for so long for a number of reasons. The first is that I feel like I'm abandoning you guys. Today's post is prompted by a simple message I received on Ravelry. To paraphrase, it said "I read your blog", which was enough to make me feel guilty enough to update it. The second reason I don't like blogging so infrequently is that I feel like there's no flow between posts. I often knit quickly enough that if too much time lapses between posts, I'll be showing you entirely different projects in each one. Something I personally like about other blogs is seeing the process of how something is created, which can't be achieved here unless I blog more often. Or knit more slowly. And I'd rather not knit more slowly. Blogging at the rate that I do also causes me to omit a great deal of information, ideas, and thoughts that I would love to share with you guys. Believe it or not, there's usually something I want to share here on a near daily basis, but by the time I sit down to write a post, I have forgotten half of it, 40% seems obsolete, 5% is so belated that I don't bother sharing it, and the rest I try to cram into a single post, causing it all to be rather truncated and lacking my forgotten (rare) insights and even more rare witty remarks. Case in point? Alpaca shearing. Alpaca shearing at the farm was several weeks ago now and I never told you about it. At the time it was because I was tired after the 16 hours on the farm and I was quite emotionally distraught due to an incident near the end of shearing day and now it seems so long ago that I find myself thinking, "why bother?" 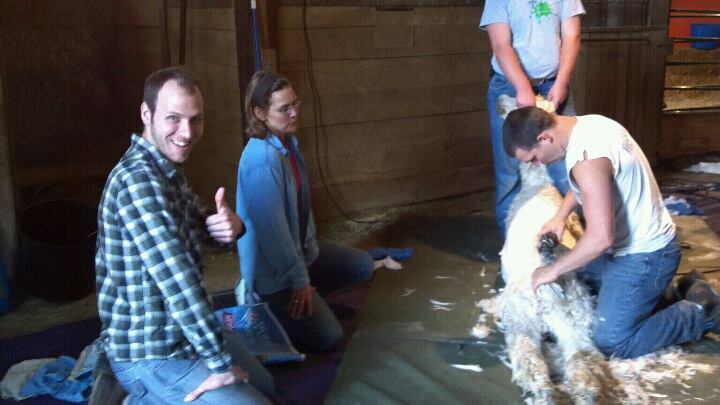 So instead, here's a picture of me at the shearing. Imagine an entire post to go along with it, most of which would talk about how much fun I had. We sheared 89 alpacas and 1 llama that day and I got the best job in that I, along with Tamara (next to me in the photo) got to sort the fleece as it came off the animal. This means I got to roll around in touch the fleece of almost every single animal on the farm. I missed a few due to the fact that I was forced to eat lunch. It also means I got spit on and peed on all day long, but does it look like I cared? I learned so much that day. Since my last post, I've also celebrated the marriage of one of my very best friends (I played the bagpipes at her wedding), quit my job, and moved into a new house. Because I like to lay blame on factors outside of my control, I'm going to say that part of the reason I haven't been blogging is because I, once again, do not have internet access at my new place. Why? Because I'm cheap and can't afford it. Wow, I got way off track. This is a knitting blog, isn't it? Look here, I finished a shawl. It's obviously not blocked yet, but I have a modicum of hope that once it is, it will look somewhat beautiful. I see that I haven't talked about this shawl in two months, so as a refresher, the pattern is the Mountain Peaks Shawl by Miriam Felton and I'm using some of my handspun superwash BFL, the fiber for which was gifted to me by Anne over at Wooly Wonka Fibers. I find this shawl particularly interesting because when indoors, the color (to my eyes) tends to read as some sort of light brown/beige/khaki/I don't know what I'm talking about when it comes to color. Only when the shawl is outside in natural light can you see those different colors, particularly the blue. In fact, I didn't even notice how cool the edging looked until I took it outside to take a picture today. I'm excited to block it now. Because I seem to have a knack for tossing projects by the wayside as soon as I reach the finishing stage (and I have a vest, a sweater, this shawl, a pair of mittens, and a pair of fingerless gloves to prove this theory), I have already moved on to my next project. This time it's a thick, warm sweater, because I can think of nothing more appropriate or comfortable to work on in this 90 degree heat than a sweater that will most likely be too warm for 362 days out of the year. Back to Hlekkur. I liked the pattern both because of how well the white stood out from the background and because it inspired in me the idea that an Icelandic sweater doesn't need to be a pullover. It can have a zipper if I want it to, and I want it to. The only difference is that when I'm done knitting a pullover, I will cut it open. Super simple. The pattern isn't available on Ravelry, but you can find it over on Patternfish. (It's free to make an account.) Thanks go to Mel for finding a source for this pattern. He also informed me that Hlekkur means "link", as in a part of a chain. This makes sense considering the patterning around the yoke. I think it's important to understand the qualities of a particular yarn or fiber when choosing the yarn for a project. I am by no means an expert when it comes to Icelandic sweaters, but I do know that they are most often made with Lopi yarn. From my understanding, this is a yarn spun from Icelandic sheep - makes sense. Icelandic sheep have a double coat, meaning that there is a longer, coarser outer layer and a shorter, softer undercoat. Lopi yarn contains both fibers spun together to create a singles yarn. The long, coarse fibers provide strength against abrasion while the shorter fibers provide warmth and a bit of softness. Take this knowledge of the fibers and combine it with the fact that Iceland is cold and the sheep come in a variety of natural colors and it isn't hard to imagine how the first colorwork yoke came into being in Iceland. Colorwork shows off the beautiful array of natural shades and provides an extra layer of warmth against the bitter chills of winter. All that being said, I am not using Lopi to knit my sweater. I am using Cascade Soft Spun. It is similar to the yarn called for in the pattern in that they are both loosely spun singles and I can get gauge with the Cascade yarn. One big difference is that Peruvian Highland sheep (which provide the wool for the yarn I am using) is not a double-coated breed and therefore my yarn does not have coarse guard hairs that will stand up well to wear and tear. What does this mean? My sweater will not last as long as a traditional Lopapeysa. My sweater will also most likely start pilling the minute I put it on, though a somewhat denser gauge may have the effect of staving this off a bit. My sweater will also be softer, which is the tradeoff. The important thing is that my yarn choice was a conscious, informed decision based on my understanding of the qualities of both the yarn called for in the pattern and the yarn I chose to substitute. By knowing how each yarn behaves, I am able to predict the type of fabric that would result from knitting with them and decide which I prefer. In this case I chose softness over longevity, even if it means my sweater won't be a true Lopapeysa. You can't do much about lemonade. Don't feel guilty about infrequent posts. I have your blog on Feeddler on my iPad, so your new posts automatically show up. I read and enjoy them without once thinking of their frequency/infrequency. I have been blogging the same way lately. I blame Ravelry and Facebook and just plain old everything else. I love Vedis's patterns, they have a nice rhythm to them! Do you carry your floats as you knit? There are plenty of helpful youtube videos to show how to do it with the yarn in either hand (if the carried yarn is in the left or the right hand). I recently made a zippered cardigan by her... LOVE it, and then it got warm. I plan to wear it to Rhinebeck this year. One thing to think about is the steek... the pattern I did had only 2 stitches. I think that 4 might have been better. And perhaps if you're using a different yarn that might be a good idea (the lopi might more easily felt together?). Look around for crochet steak tutorials too... I might try this next time too, several people have commented on how helpful it was. First off, really... do whatever fits your schedule. I enjoy catching up with you when you are here. I get that people have lives - go have yours. Next! I love love love that you paired up my fiber (Wood Duck?) with Mim's gorgeous pattern. How wonderfully that came out! My opinion (for whatever that is worth) is that your blog posts are always so well written and so fun, it makes up for the infrequency. It's always such a nice surprise when I discover you have written a new one! Thank you for all that you share!!! Hah! So you saw people's reviews of your blog online? That must mean it's interesting enough to warrant a review. I think I just fly under the radar, but that's fine... and yes, I did just do a couple quick searches to see if anything came up. I recently started and restarted a draft for my blog saying how my blog is boring and blah blah blah. I moved on and just deleted the thing. You can't do much with lemonade. Now I'm curious about the emotional crisis on Shearing Day... But from the picture it looks like you were in your element there! I love seeing how your handspun knits up. Look at you go! So lovely. As for it being "obviously not blocked yet" and your reference to it looking kinda crappy, I think I may need to go tramping about the internet and write a few reviews about how you are obviously out of touch with reality. Someone at work - no, several people at work - use the phrase "it is what it is" so often that it makes me a wee bit grumpy. I'm totally stealing your lemonade. I think I'm rather fond of using references out of context, so that people have know idea what I'm saying. Perhaps it makes me feel witty. Do you plan to spin for Tour de Fleece? "... so that people have no idea..."
It is great to see news from you! I will not be all gracious and selfless like the commenters above, and will instead tell you that YOU ARE MISSED WHEN YOU ARE AWAY! I love the sweater that you picked, and I couldn't agree more with your description of the yarn choice - very well said! I don't get why people are "annoyed" when a blogger they like doesn't blog as frequently. I get sad, sure, and especially if they stop altogether, but mad? Why would I be mad at someone (that I don't even know in real life) who is not making my happiness their first priority? If it's not a painful memory, though, I am intrigued about the incident on shearing day ... sounds like quite a story! I always enjoy reading your posts - and must say I am surprised at the reaction you describe! Some people get annoyed? Why not simply be happy when there is a new post to read?